So the first thing it does is check to see if you’re allowed to load a PE image in the first place via the CheckLoadByteArraySupported method. Basically, if the executing assembly is a tile app, then you will not be allowed to load a PE file as a byte array. 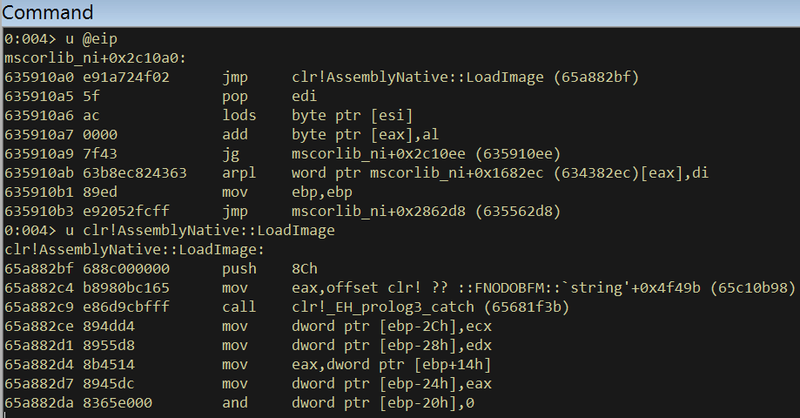 It then calls the RuntimeAssembly.nLoadImage method. If you click on this method in ILSpy, you will be disappointed to find that there does not appear to be a managed implementation. 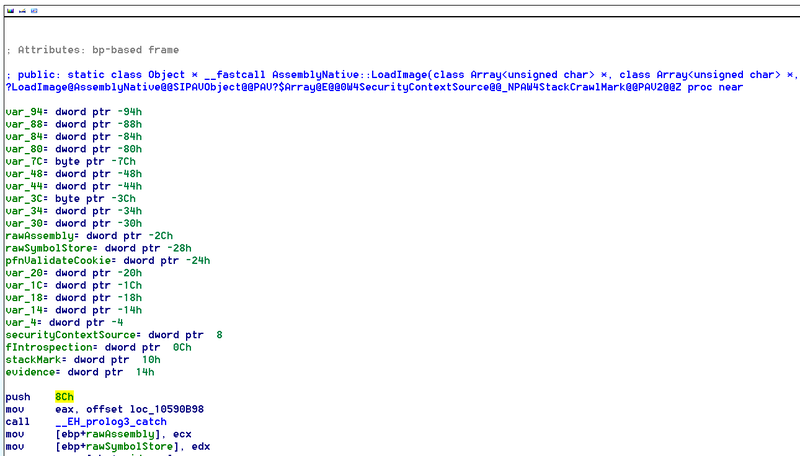 As you can see, all you get is a method signature and an InternalCall property. To begin to understand how we might be able reverse engineer this method, we need to know the definition of InternalCall. According to MSDN documentation, InternalCall refers to a method call that “is internal, that is, it calls a method that is implemented within the common language runtime.” So it would seem likely that this method is implemented as a native function in clr.dll. 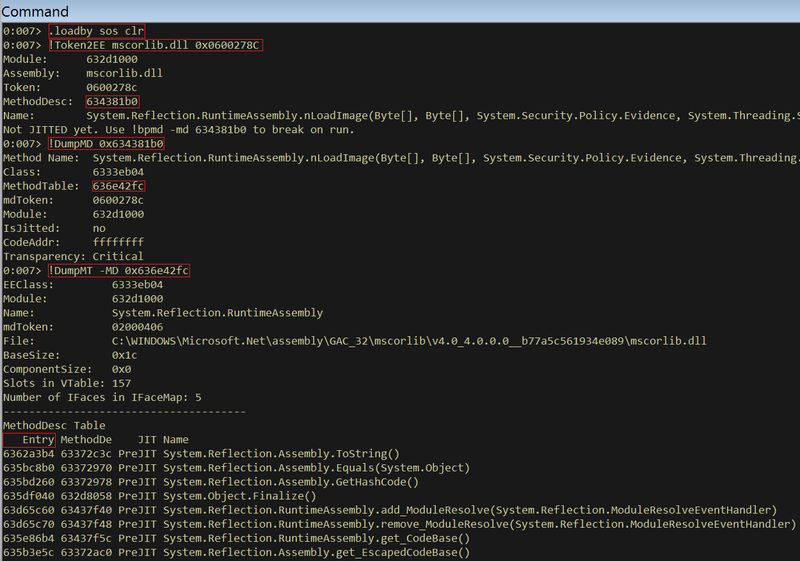 To validate my assumption, let’s use Windbg with sos.dll – the managed code debugger extension. My goal using Windbg will be to determine the native pointer for the nLoadImage method and see if it jumps to its respective native function in clr.dll. I will attach Windbg to PowerShell since PowerShell will make it easy to get the information needed by the SOS debugger extension. The first thing I need to do is get the metadata token for the nLoadImage method. This will be used in Windbg to resolve the method. Retrieves the MethodDesc of the nLoadImage method. The first argument (mscorlib.dll) is the module that implements the nLoadImage method and the hex number is the metadata token retrieved from PowerShell. So the native address for nLoadImage is 0x635910a0. Now, set a breakpoint on that address, let the program continue execution and use PowerShell to call the Load method on a bogus PE byte array. You can now use IDA for further analysis and begin digging into the actual implementation of this InternalCall method! After digging into some of the InternalCall methods in IDA you’ll quickly see that most functions use the fastcall convention. In x86, this means that a static function will pass its first two arguments via ECX and EDX. If it’s an instance function, the ‘this’ pointer will be passed via ECX (as is standard in thiscall) and its first argument via EDX. Any remaining arguments are pushed onto the stack. So for the handful of people that have wondered where the implementation for an InternalCall method lies, I hope this post has been helpful. Ha! The only reason I wrote the article is because I couldn't find any other articles describing how InternalCall was implemented. Funny how we both decided to target the clr PE loader. Small world, eh? Great article, by the way!